You choose to register for 05 Km run in Kei. Valid for 5 October 2019. Hi there, what can we help you with? You choose to register for 05 Km run in Kei. Valid for 5 October 2019. 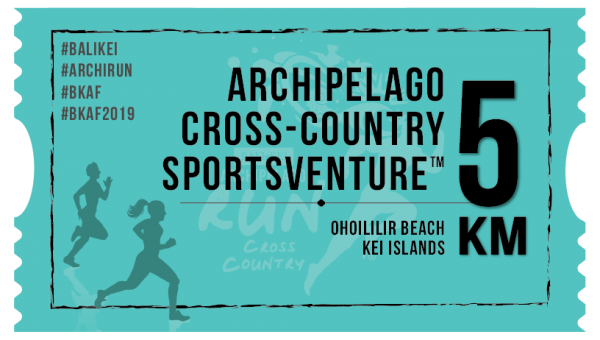 The start and finish spot will be at Ohoililir beachside village. Be there at 5:00 AM sharp. WINNER PRIZES: The first place will get IDR10 Million (Male & Female); the second place at IDR8 Million (Male & Female) and the third place is at IDR5 Million (Male & Female). This is more than a marathon, it is a cross-country run. Get yourself in shape before doing this. Orders are processed only after a billing address, and other billing information, has been verified. Occasionally, we receive incorrect billing or credit card account information for a ticket order that can delay processing and delivery. In these cases, Customer Service will attempt to contact you, using the information provided at the time of purchase. If Customer Service is unable to reach you after its initial attempt, Customer Service may cancel your order and may sell your tickets to another customer without further notice. If the amount you pay for a ticket is incorrect regardless of whether because of an error in a price posted on this website or otherwise communicated to you, or you are able to order a ticket before its scheduled on-sale or presale date or you are able to order a ticket that was not supposed to have been released for sale, then: The Promoter will have the right to cancel that ticket (or the order for that ticket) and refund to you the amount that you paid. This will apply regardless of whether because of human error or a transactional malfunction of this website. Unlawful resale of tickets (or attempted resale) is grounds for seizure and cancellation without compensation. A ticket shall not be used for advertising, promotions, contests or sweepstakes, unless formal written authorization is given by the Event Promoter, provided that even if such consent is obtained, any use of Event Promoter's trademarks and other intellectual property is subject to the Event Promoter’s consent. Performers, Artists, Acts, Players are subject to change or cancellation at any time without notice. No refund will be owed if any performer, artist, act, player or any other scheduled performance, person or group is changed or canceled and the event still occurs. All purchases are non-refundable and not able to be exchanged. Notwithstanding, some promoters have different rules regarding the ability to refund and/or exchange your purchased tickets. Please refer to each event site for specific exclusions. Occasionally, events are canceled or postponed by the promoter, team, band or venue. Should this occur, we will attempt to contact you to inform you of refund or exchange procedures for that event. For exact instructions on any canceled or postponed event, please check the event information online or contact us. If a refund is issued, then the Promoter will most likely give you a refund by issuing a credit to the credit card that you used to purchase that ticket, and the holder of the ticket will not be able to physically present it for a refund. Customer Service typically only offers refunds and/or exchanges based on the promoter's, team's or venue's instructions. Customer Service is not obligated to issue a refund except to the extent that the promoter, team or venue responsible for bringing you the event (1) instructs us to issue a refund, and (2) provides us with the ticket funds necessary to issue refunds. In order to receive a refund or an exchange that may be offered, you will have to comply with the promoter's, team's or venue's instructions or deadlines, which, along with the decision about whether or not to issue a refund or an exchange, may be at the promoter's, team's or venue's discretion.